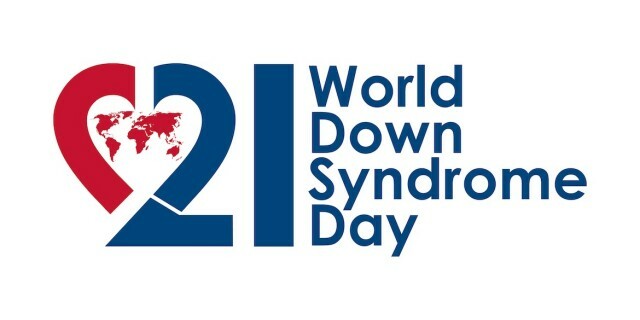 I have to admit that prior to Noah being born I had no idea that March 21st is World Down Syndrome Day, so don’t feel bad if you didn’t know either. But it is. And if you will give me about 3 minutes of your time, I’ll tell you what it’s all about. By the way the cool shirt Noah is wearing in the video was given to us by our friends at the National Down Syndrome Society when we visited their offices in New York a few months ago. You can pick one up for yourself from Rhyme Clothing.10% of every shirt purchased goes to the National Down Syndrome Society to further Down Syndrome Awareness! Pretty cool, huh? If you are new to the world of Down syndrome, welcome. We started this website to give the world a look into what life is like raising a child born with Down syndrome by posting a daily one minute video about our life. We hope you will subscribe to our daily videos and take part in the story we are sharing. We also hope you will visit our Facebook page where you can meet thousands of families sharing their stories as well. Feel free to drop by, say hi, and ask questions; we’d love to meet you! If you are raising a child with Down syndrome I hope you will take a minute to share this post with someone in your life who isn’t. Hopefully in doing so they will learn more about Down syndrome, and how this story isn’t a sad one. But a very beautiful one. What are you doing to help raise awareness for World Down Syndrome Day? Feel free to post any pictures or videos in the comments below! He does brighten up my day!! Love you Noah! Great post, thanks so much for sharing your story and all that you are doing!!! 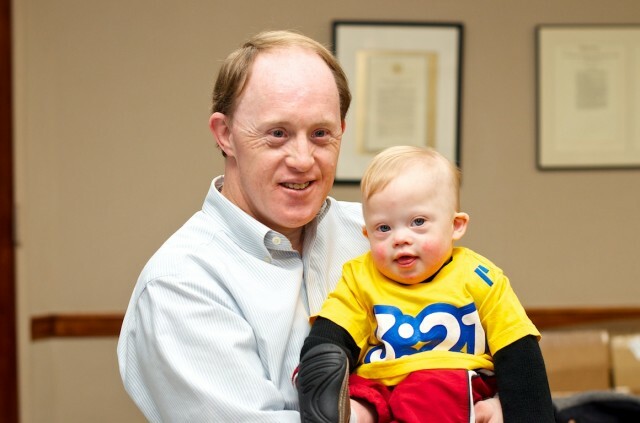 Happy World Down Syndrome Day to all! Thank you Rcik and Noah for the great video. @030cffada93b1354e3ae40c4e42b457f:disqus Awww, thanks for sharing that with us. How old is Gavin? Thanks for all you do to bring a positive awareness to Down syndrome. What is Noah’s birthday? Isaac is 15 months too. His birthday in 11/30. Was your son born with Down syndrome? If so, did you guys know ahead of time? My son was born with Down Syndrome on 02-29-12. He is 21 days old today. He is my first born. He has been in the NICU since he was born due to an AV Canal defect which was making it hard for him to breathe and eat on his own. He had an oxygen tube and feeding tube for nearly 3 weeks. I am happy to announce that since Friday the 16th he has been off of the oxygen tube and as of Monday he has been off the feeding tube. My husband and I give all the glory to God, we have been praying for baby Royal non stop, we really did not want him to come home with a g tube or oxygen tube. He is eating like a champ now and his doctor told us he can come home this week. We are new to the world of Down Syndrome and your blog has been a tremendous beacon of light for families new to DS or not. I never imagined I would be taking this journey with my new family and now I am so eager to share his life with all our friends and family. Please continue to pray for baby Royal’s heart, I know God can heal him. I look forward to reading about Noah and watch him grow,. your story is very much like ours..My son also had av canal defect. All your trials now will be rewarded once he receives his operation. Marcos is such a healthy boy and you will be amazed at the progress your child make. Know that you are not on this journey alone. @c96040b73f1fea1c442077c851432888:disqus Wow, thanks so much for the very kind and encouraging words. 🙂 First I want you to know that I just prayed for you and your family. I also thanked God for letting Royal be born to such loving parents who trust in the Lord. That is fantastic! Where are you guys from ,and how did you learn about our website? I also enjoy learning how people connect with us. Please let us know if there are any questions we can try to answer for you as well. I have a little brother with Down Syndrome. Alike your little one, my brother also had difficulty breathing. He also was born with an AV Canal defect. He underwent open heart surgery at 4 months old. We were told he would need open heart surgery about every 10 years depending on how his heart’s doing, growth etc. My family and I were incredibly sad and afraid but we knew it was for the best. It’s been 7 years now since my brother’s surgery and he is doing great! We actually took him to his annual Cardiology appointment this morning and the doctor’s were pleased with how my brother is doing! They encouraged us to push him to run and walk longer distances (my brother can be a little lazy). I know parents are sometimes worried about over exerting their child, because my parents are still worry warts, but trust me your little one will be just fine. Seven years from now you will be using words similar to mine to encourage a family one day. You too will be sharing your wonderful news about your little man’s health with a family who may need encouragement and inspiration. Stay positive, pray, and continue to give your beautiful baby all the love in the world. I am not sure if you are from NYC but here is my brother’s heart surgeon:http://cardiac-surgery.med.nyu.edu/about-us/heart-surgeons/ralph-s-mosca. He did an amazing job on my brother. I am sure there are many great Cardiologist out there, but just thought I’d share our cardiologist since my family is forever grateful to this man.I am glad your little one is off the oxygen tube now. I am sure the little guy will be fine. Best of luck to your family and my prayers will be with you all! Noah shines. Life is a gift and privilege from our Lord. Thank you for everything you are doing , i have a niece with down syndrome .. She is three years old and loves learning new things and meeting new people .. Thank you so much ..
@facebook-1748558108:disqus wow…he is awesome!!! Thanks so much for sharing. How old is he?? Noah is and I am sure will be amazing, but I think a big part of the credit will go to his amazing father (and I assume his mother). I could only wish that every family that has been touched by DS, had a father like you. So many times, the mother seems to be carrying the load alone. I love to see you play such a big part, and being so proactive. I was at the World Down Syndrome Conference today and they shouted you out today. That’s amazing to be recognized as such a positive figure. Keep up the great work. We all got to see little Ryan too. He’s adorable. Noah is such a cutie saying goodbye!! @74ef4bd421fc59c6b1c0803238f96300:disqus Yah, I heard we were mentioned, but I didn’t get a chance to see it. 🙁 It is very cool, and very humbling. We’re honored. What was the context in which we were mentioned? Do you remember? One of the members on the Panel asked Jim Langston to stand up with Ryan for all to see. The panel member went on to tell everyone in the conference room about how your blog was one of the first to bring much attention to Ryan’s Target ad. They thanked you for having such a helpful site that families can turn to. Good stuff. You should be proud. That is very cool. Thanks for sharing that! @a7919997fbf825082868e038c345392a:disqus Thank you for supporting us! Do you have a child with Down syndrome? Camp Barnabas loves everyone who has the DS diagnosis-young and old! @0d8c3e175384cc5e9a0affcde019abf4:disqus Cool! Where is your camp located? What sorts of things do you guys do there? Tell me more…. Hey, I recognize that young man! I remember the TV show very well. Life Goes On was a charming show. @facebook-826848348:disqus He’s looking good these days, isn’t he!? Happy World Down Syndrome Day! I cannot tell you how much your little guy brightens my day with his beautiful smile. That picture of him after he’s tasted the vegamite is hysterical, and it never fails to make me laugh. All laughs aside, I love what you do, to help educate people who would otherwise not understand what it means to have a child with Downs. It’s not a death sentence, nor is it the end of the world, just the beginning of a very special journey. When I became pregnant with my second child, I had a quad-screen done. The results came back with the markers for DS high, and was given the choice of having a genetic amnio done to determine whether or not she did have DS. I decided not to, because it wouldn’t have mattered to me whether or not she had it, all I cared about was that she was healthy and happy. She is both of those, as you can see in my avatar. They later determined that the markers were elevated because of my advance maternal age, I was 41 when I gave birth. Hugs for Noah! That was a great video! My favorite part what Noah waving bye bye! He is so cute and is getting so big!! @facebook-581130879:disqus Thanks….and I agree…time is going by quick, quick, quick. We cherish every second with this little guy. I HAVE A DOWN SYNDROME GRANDSON. HIS NAME IS LUKE. HE IS THE MOST BEAUTIFUL, SWEET LITTLE BOY. HE HAS TOUCHED SO MANY PEOPLE. HE JUST LIGHTS UP THE DAY FOR EVERYONE. HOW ANYONE COULD NOT WANT A D.S. CHILD IS BEYOND ME. WE HAVE SO MUCH LOVE IN OUR HEARTS FOR HIM, IT’S UNIMAGINAL! NOAH REMINDS ME OF LUKE A LOT. Just got chance to watch the video! It’s great! Harry has just started a new physio group and STOOD with only a bit of support for 15 MINUTES playing with paint!!!!!!!! What a way to celebrate Down’s Syndrome Day don’t you think!! Love your video.. Noah is such a darling..! @e6eac8929334e84597b0aac8d30434cb:disqus Thank you very much! LOVE Noah (& you). He brings a smile to my face daily. Thank you for sharing w/all of us. @0f6bc20aceb238ea1ece2daef4f7a75b:disqus Thank you for taking the time comment and encourage us! I teach children with Down’s Syndrome, they are a joy in my life! @bae2208b3f10a629c1fbfcc0844312c2:disqus Very cool. Thanks for sharing. What age range, and what subjects do you teach? Thanks for all you do to impact the next generation of leaders! My son has Down syndrome. I’m confused. Is this blog about you (Noah’s dad) or Noah? Why is it called Noah’s dad? Do you call him Noah’s Dad’s son? Weird. anyway, I also noticed lots of splicing/editing in the video; is that how you live your life with your boy with Down syndrome? Anyway, interesting. @4826f87f3d4881d51cf84565cac8e0a9:disqus Thanks for your comment. I can see how the name of our site could be a bit confusing. The site is about our son who was born with Down syndrome, and I’m his dad, thus “Noah’s Dad.” “Noah.com” wasn’t available as a domain, so I figured since I was his dad, and I’d be writing most of the content, Noah’s Dad made since. (I wish Noah.com was available though, that would be awesome!) And I just call him Noah. I’m sorry of the name of the site confused you, and I’m not that creative and NoahsDad.com was the best I could come up with. In regard to the video, I try to edit all of our videos somehow. Usually that involves making some simple jump cuts to pace the video a bit. In the case of this video it was shot in the evening time after Noah had dinner so he was a little cranky. Therefore I had to wade through the footage I was able to get in order to piece together this video. It’s not going to win an Emmy that’s for sure, but we had lots of fun making it, and I think overall people enjoyed it, and I can’t ask for much more than that. I’m not sure what you meant by “is that the way [you] live life with [your] boy with Down syndrome?” Your question was int the context of asking me about why there were so many jump cuts in today’s video. Sorry if I misunderstood your question. I hope that answers your questions, and gives you a better understanding about our site. How old is your son by the way? Feel free to post a picture of your son / family if you’d like. Thanks so much for taking the time to leave a comment and letting me try to answer your questions. Please let me know if you have any other ones. I look forward to learning more about you and your family. This video made me smile and brightened my day! What a sweet boy you have – my son Lukas is about the same age (16 months) and it appears all boys are busy at this age!! @google-906cff9ac271851d6da3aa431855ab3f:disqus Thanks so much for the kind words! And how cool that Noah and Lukas (cool way to spell Lukas by the way!) are pretty much the same age. Not sure what you mean? The sound works fine for me. Rick, thanks for bringing this to everyone’s attention. I am interested in the young man holding Noah. My son Billy, who has Down syndrome, is 56. Is this young man about that age? He is a fine looking man; so is Billy. Billy spreads the awareness of Down syndrome in his job at a grocery store, where he has people who will only go through his line. They say he always makes them feel happier. He also ushers in church and is put on the usher list almost every Sunday. The leaders say they can always depend upon him. I’VE WORK WITH PEOPLE WITH DOWN SYNDROME.THEY ARE THE WOUNDERFULL MADE BY OUR LORD THEY HAVE SUCH LOVE IN THEIR HEART FOR EVERYBODY. I SUPPORT DOWN SYNDROME DAY. I LOVE ALL CHILDREN THEY GIFT OF LIFE NO CHILD SHOULD FELL THAT THEY ARE REJECTED .GOD DOES’NT MAKE JUNK. Noah is an absolute angel. My son is autistic and I do have some friends whose children have down syndrome. Thank you for educating me. Please hug your sweet angel for me. I love the video, it’great. I celebrated for my son, Luke, 9m, on World Syndrome Day and the students that I work with. I wore a shirt that said, World Down Syndrome Day, and one of the students came up to with a big smile and said proudly “Hey, that’s me, I have Down Syndrome”. This World Downs Syndrome day the Lord blesed us with the birth of our little Karis Mira! I was just directed to you log today and already am so thankful for your writing it!!! (her name… Karis, means unmerrited Grace or favor… Mira means peace… We named her before she was born and before we knew she had an extra chromosome…) what a wonderful resource you have here, I have so enjoyed reading your posts… Probably too much… I’d best go get dinner out of the oven before it s burned! so grateful to you for all the posts and for ensuring that Dad’s can be a large part of their child’s life in many organisational ways …..I am soooooo proud of you just living daily trying to do ALL you can for Noah . You give hope to many men who are frightened and don’t know what to do …..and I profession I see many men walk away feeling ashamed and overwhelmed . I now know some who have stayed and take little steps of things they believe that help their baby and family. please continue to post all the normal everything you an your family do. you inspire many ……sending love and praise…….